Amie Lee Clarke was born in June 1982 at St Helens, Lancashire. Frederick Moulsdale married Janette Margaret Hardman, daughter of George Hardman and Agnes Featherstone, in September 1989 at St Patricks Church, Clinkham Wood, St Helens, Lancashire. Frederick Anthony Moulsdale was born on 21 July 1990 at St Helens, Lancashire. David Thacker was born on 23 April 1939. He married Betty Smith, daughter of Benjamin Smith and Edith Emily Parsonage, on 15 August 1959. Linda Barbara Thacker was born on 20 July 1960. As of 8 June 1985,her married name was Lambert. She married Richard John Lambert on 8 June 1985. Alan David Thacker was born on 13 July 1962. Robert David Thacker was born on 5 February 1965. He married Denise Hannah on 30 August 1986. James Morris was born circa 1833 at Parr, St Helens, Lancashire. He appeared on the 1851 Census in Sutton Boundary, Sutton, St Helens, Lancashire, and Thomas Morris, Anne Lowe, Margaret Morris, Thomas Morris, Martha Morris, Joseph Morris, William Morris and Ellen Morris were living in the same household; Thomas, the head, was a blacksmith as was his son James. James Morris married Mary Peel. 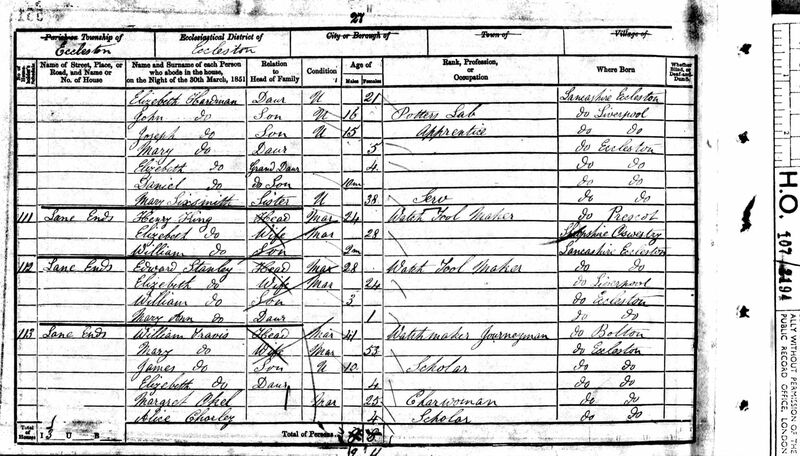 James Morris appeared on the 1861 Census in, St Helens, Lancashire, , and Mary Peel, Elizabeth Morris, Ellen Morris and Thomas Morris were living in the same household; James the head was a blacksmith. Also lodging with the family were a charwoman Margery Witon(?) and her daugther Mary Ellen. At this time James' father was living next door. James' wife Mary married again in 1866 to a Joseph Carr, so possibly James died before this date. Thomas Morris was born circa 1841 at Parr, St Helens, Lancashire. He appeared on the 1851 Census in Sutton Boundary, Sutton, St Helens, Lancashire, and Thomas Morris, Anne Lowe, James Morris, Margaret Morris, Martha Morris, Joseph Morris, William Morris and Ellen Morris were living in the same household; Thomas, the head, was a blacksmith as was his son James. 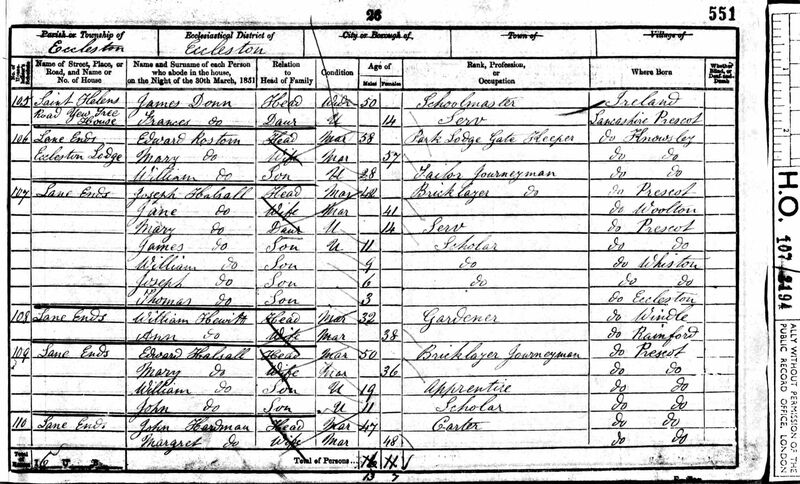 There is a possible entry for Thomas, a miner, in the 1871 census at 10 Peasley Cross with his wife Dorothy aged 33yrs born at St Helens, and son Joseph Henry aged 14? (maybe months) born Sutton. There is a possible entry for Thomas coal miner (39yrs) and his wife Dorothy (42) and children Joseph H. (11, Sutton), Mary Jane (8, Sutton) and Frances S. (3, Shevington). Martha Morris was born circa 1844 at Parr, St Helens, Lancashire. She appeared on the 1851 Census in Sutton Boundary, Sutton, St Helens, Lancashire, and Thomas Morris, Anne Lowe, James Morris, Margaret Morris, Thomas Morris, Joseph Morris, William Morris and Ellen Morris were living in the same household; Thomas, the head, was a blacksmith as was his son James. 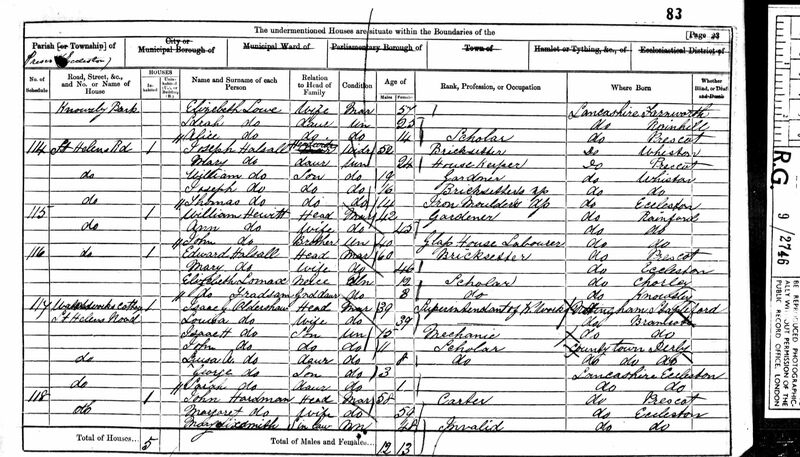 Martha Morris appeared on the 1861 Census and Thomas Morris, Anne Lowe, William Morris, Ellen Morris and Henry Morris were living in the same household; Thomas was still a blacksmith. In this year Thomas was shown in the electoral register at 71 Hills Moss Lane (where his daughter Ellen and her husband Daniel Hardman were then living). William Morris was born circa 1849 at, St Helens, Lancashire, . He appeared on the 1851 Census in Sutton Boundary, Sutton, St Helens, Lancashire, and Thomas Morris, Anne Lowe, James Morris, Margaret Morris, Thomas Morris, Martha Morris, Joseph Morris and Ellen Morris were living in the same household; Thomas, the head, was a blacksmith as was his son James. 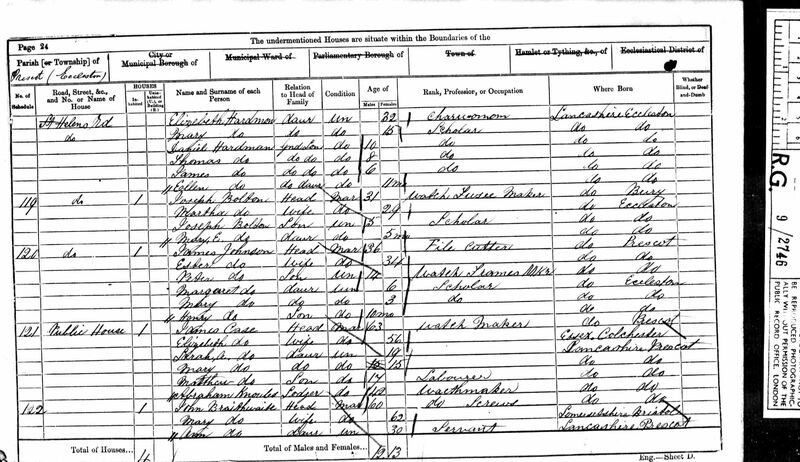 William Morris appeared on the 1861 Census and Thomas Morris, Anne Lowe, Martha Morris, Ellen Morris and Henry Morris were living in the same household; Thomas was still a blacksmith. In this year Thomas was shown in the electoral register at 71 Hills Moss Lane (where his daughter Ellen and her husband Daniel Hardman were then living). 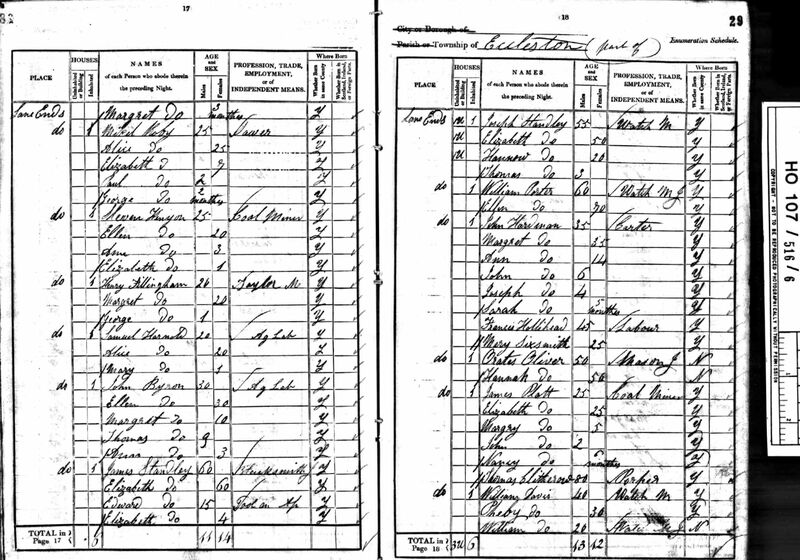 William Morris appeared on the 1871 Census in, St Helens, Lancashire, , and Ellen Morris, Anne Lowe, Henry Morris and Thomas Morris were living in the same household; Thomas, the head, was a Blacksmith and Henry is a labourer. Henry is described here as a grandson as opposed to son in the census of 1861. William Morris witnessed the marriage of Daniel Hardman and Ellen Morris on 4 September 1871 at, St Helens, Lancashire, ; Daniel gave his occupation as a labourer and both he and his bride resided in Sutton. William Morris married Alice (?). William Morris appeared on the 1881 Census in 79 Bold Road, Sutton, St Helens, Lancashire, and Alice (? ), Annie Morris, Thomas Morris and Elizabeth Morris were living in the same household; William, the head gave his occupation as a blacksmith. William was living just round the corner from his father and brother in law Daniel Hardman who lived on Hills Moss Lane. Marriage* William Morris married Alice (?). John Hardman was born circa 1804 at Prescot, Lancashire. He married Margaret Sixsmith on 22 July 1822 at, St Helens, Lancashire, . John Hardman appeared on the 1841 Census in, Lancashire, , and Margaret Sixsmith, John Hardman, Joseph Hardman, Ann Hardman, Sarah Hardman and Mary Sixsmith were living in the same household; John the Head is described as a carter. Also in the house is Francis Hollihead a labourer. John Hardman appeared on the 1851 Census in, Lancashire, , and Margaret Sixsmith, Elizabeth Hardman, John Hardman, Joseph Hardman, Mary Hardman, Elizabeth Hardman, Daniel Hardman and Mary Sixsmith were living in the same household; John, the head was described as a carter, young John as a potters labourer, and Mary Sixsmith as sister and servant. It is more likely that Mary was the sister of John's wife who was Margaret Sixsmith. John Hardman appeared on the 1861 Census in, Prescot, Lancashire, , and Elizabeth Hardman, Margaret Sixsmith, Thomas Hardman, James Hardman, Ellen Hardman and Daniel Hardman were living in the same household; John, the head, was a carter. Elizabeth was a char woman. Also staying at the house was Mary Sixsmith sister in law who was described as an invalid. John Hardman appeared on the 1871 Census in, St Helens, Lancashire, , and Thomas Hardman, James Hardman, Ellen Hardman, Samuel Hayes, John Hayes, Ashton Hayes, Mary Hayes, Samuel Hayes and Elizabeth Hardman were living in the same household; Samuel Hayes the head was a collier. Thomas, James and Ellen were recorded as step children. John Hardman was a labourer and recorded as a boarder. Her married name was Hardman. Margaret Sixsmith was born circa 1803 at Prescot, Lancashire. She married John Hardman on 22 July 1822 at, St Helens, Lancashire, . Margaret Sixsmith appeared on the 1841 Census in, Lancashire, , and John Hardman, Joseph Hardman, Ann Hardman, Sarah Hardman, John Hardman and Mary Sixsmith were living in the same household; John the Head is described as a carter. Also in the house is Francis Hollihead a labourer. Margaret Sixsmith appeared on the 1851 Census in, Lancashire, , and John Hardman, Elizabeth Hardman, John Hardman, Joseph Hardman, Mary Hardman, Elizabeth Hardman, Daniel Hardman and Mary Sixsmith were living in the same household; John, the head was described as a carter, young John as a potters labourer, and Mary Sixsmith as sister and servant. It is more likely that Mary was the sister of John's wife who was Margaret Sixsmith. 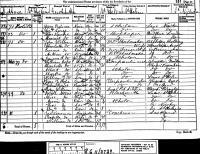 Margaret Sixsmith appeared on the 1861 Census in, Prescot, Lancashire, , and Elizabeth Hardman, John Hardman, Thomas Hardman, James Hardman, Ellen Hardman and Daniel Hardman were living in the same household; John, the head, was a carter. Elizabeth was a char woman. Also staying at the house was Mary Sixsmith sister in law who was described as an invalid. John Hardman was born circa 1835 at, Liverpool, Lancashire, . He appeared on the 1841 Census in, Lancashire, , and Margaret Sixsmith, Joseph Hardman, Ann Hardman, Sarah Hardman, John Hardman and Mary Sixsmith were living in the same household; John the Head is described as a carter. Also in the house is Francis Hollihead a labourer. John Hardman appeared on the 1851 Census in, Lancashire, , and John Hardman, Margaret Sixsmith, Elizabeth Hardman, Joseph Hardman, Mary Hardman, Elizabeth Hardman, Daniel Hardman and Mary Sixsmith were living in the same household; John, the head was described as a carter, young John as a potters labourer, and Mary Sixsmith as sister and servant. It is more likely that Mary was the sister of John's wife who was Margaret Sixsmith. John Hardman married Elizabeth Hesketh in 1858. 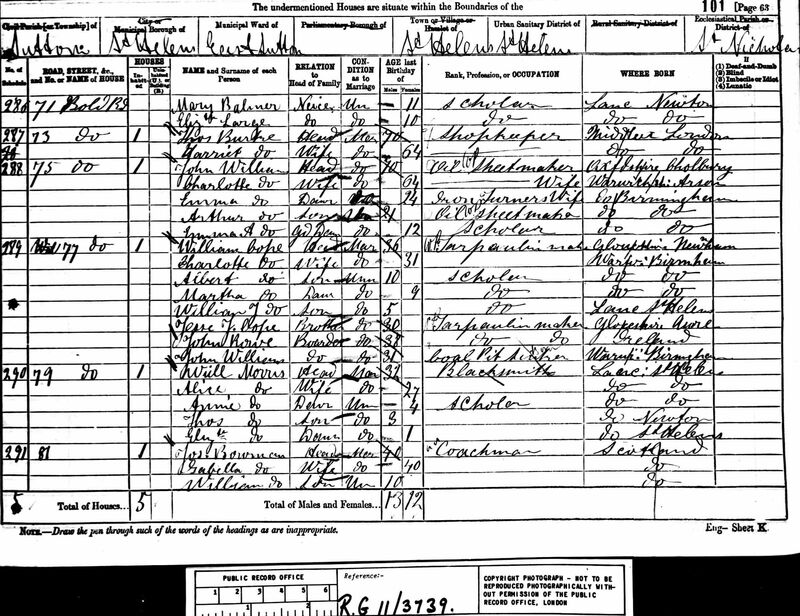 John Hardman appeared on the 1871 Census in, St Helens, Lancashire, , and Elizabeth Hesketh, Joseph Hardman, John Hardman and William Hardman were living in the same household; John Senior is described as a General Labourer, as are all of his sons. Also present is Margaret Hesketh a niece and scholar aged 8 years. Mary Hardman was born circa 1846 at Eccleston, Lancashire. She appeared on the 1851 Census in, Lancashire, , and John Hardman, Margaret Sixsmith, Elizabeth Hardman, John Hardman, Joseph Hardman, Elizabeth Hardman, Daniel Hardman and Mary Sixsmith were living in the same household; John, the head was described as a carter, young John as a potters labourer, and Mary Sixsmith as sister and servant. It is more likely that Mary was the sister of John's wife who was Margaret Sixsmith. The occupation is the same as her brother John's son John (#239). Mary Sixsmith was born circa 1813 at Eccleston, Lancashire. She appeared on the 1841 Census in, Lancashire, , and Margaret Sixsmith, John Hardman, Joseph Hardman, Ann Hardman, Sarah Hardman and John Hardman were living in the same household; John the Head is described as a carter. Also in the house is Francis Hollihead a labourer. Mary Sixsmith appeared on the 1851 Census in, Lancashire, , and John Hardman, Margaret Sixsmith, Elizabeth Hardman, John Hardman, Joseph Hardman, Mary Hardman, Elizabeth Hardman and Daniel Hardman were living in the same household; John, the head was described as a carter, young John as a potters labourer, and Mary Sixsmith as sister and servant. It is more likely that Mary was the sister of John's wife who was Margaret Sixsmith. Not sure about the relationship here but Elizabeth shown as g/dau of John Hardman #237. Elizabeth Hardman was born circa 1847 at Eccleston, Lancashire. She appeared on the 1851 Census in, Lancashire, , and John Hardman, Margaret Sixsmith, Elizabeth Hardman, John Hardman, Joseph Hardman, Mary Hardman, Daniel Hardman and Mary Sixsmith were living in the same household; John, the head was described as a carter, young John as a potters labourer, and Mary Sixsmith as sister and servant. It is more likely that Mary was the sister of John's wife who was Margaret Sixsmith.